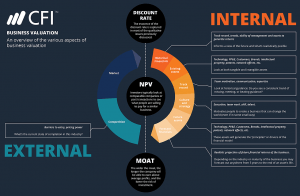 This DCF analysis infographic walks you through the process, step by step, of how to build a discounted cash flow (DCF) model to value a businessValuation MethodsWhen valuing a company as a going concern there are three main valuation methods used: DCF analysis, comparable companies, and precedent transactions. These methods of valuation are used in investment banking, equity research, private equity, corporate development, mergers & acquisitions, leveraged buyouts and finance. A discounted cash flow model takes into account all the factors that could affect a company’s current and future performance. This performance equates to certain inflows and outflows of cash, which are then discounted back to the present value. The sum of the present value of all future cash flows equals the net present value. The internal side consists of most of the data that a financial analyst has to consider when generating models. This includes the historical performance of the company, its current operations, and its future potential. The internal side also often has the most concrete or solid data, since most of the raw information used in the models is quantitative. A financial analyst, for example, will use a historical income statement to forecast future net income. This forecast will eventually flow down through other financial statements and the supporting schedules to generate an estimate of future free cash flow. This cash flow is what is used in the discounted cash flow analysis. It is important, however, to remember that the external side should be considered too. While the internal side of the DCF analysis is important and key to the quantitative side of the analysis, external factors must not be neglected when considering the future potential of a company. External forces, such as the market cycle and the growth of competitors, will indefinitely have an impact towards the performance of any company. While these are harder to forecast, educated and informed estimates must be made towards these factors if one wishes to make a more accurate DCF model. Read about the different types of financial modelsTypes of Financial ModelsThe most common types of financial models include: 3 statement model, DCF model, M&A model, LBO model, budget model. Discover the top 10 types of Excel models in this detailed guide, including images and examples of each. Financial modeling is performed for many reasons including to value a business, raise money. The infographic was designed to help you visualize the process of how to actually think about a DCF analysis in your head before building a DCF model. Please read through the various steps described in the image above to master the process step by step.